This Wooden A-Frame Sign is Double Sided! 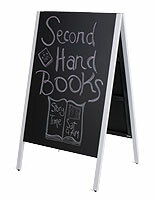 The Textured Black Board can be Written on with Either Stick Chalk or Wet Erase Pens! Each Wooden A-Frame Sign is Priced to Sell! 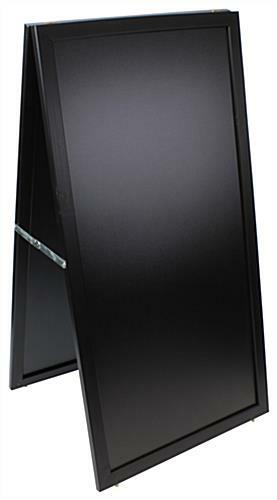 Hinged a-frame easily folds for transporting. 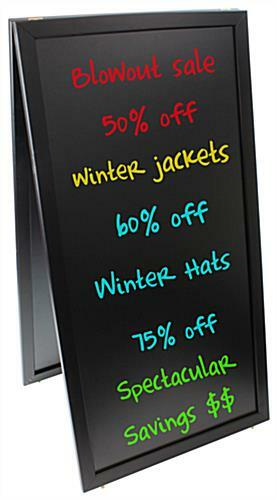 This wooden a-frame sign, called a sidewalk board, is an excellent indoor advertisement tool. The sandwich board can be seen from either direction in the aisle or lobby. 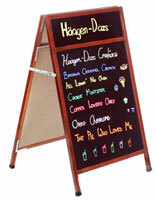 Each wooden a-frame sign that has (2) writing areas can fit large amounts of advertising on each side. This sidewalk board has a writing surface of 20"w x 42"h on both sides of the display. 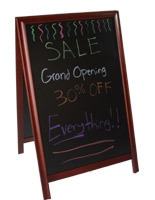 This wooden a-frame sign that has a textured surface can be written on with wet erase pens, liquid chalk, or stick chalk. The sandwich board is double sided! 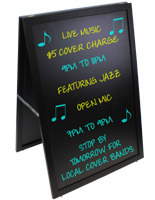 Each wooden a-frame sign that is lightweight can be easily stored away at night. The sidewalk board takes just moments to set up and take down for the night. 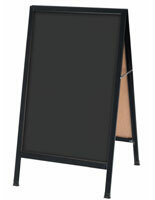 This restaurant fixture, wooden a-frame sign is a great size to fit in most vehicles. The sidewalk board can be moved from one location to another in no time at all. Each wooden a-frame sign easily opens. 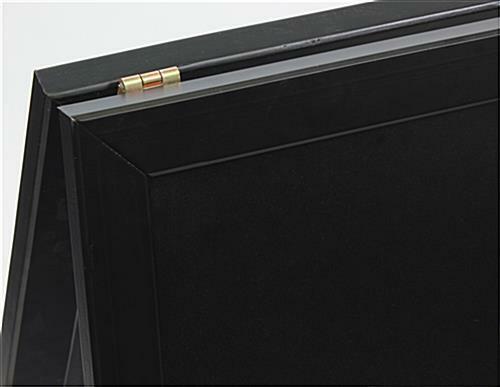 The sandwich display's middle hinge prevents the sidewalk board from over extending when open. This wooden a-frame sign has a black finish. The finish enables the sidewalk display to fit in any traditional or modern day decor. Each wooden a-frame sign drawings simply come off with a damp cloth. If the markings do not come off the sandwich board, the display comes with a magic eraser. 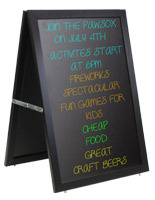 The sidewalk board is meant for indoor use only but may be put outside in fair weather conditions. 23.1" x 44.0" x 21.0"